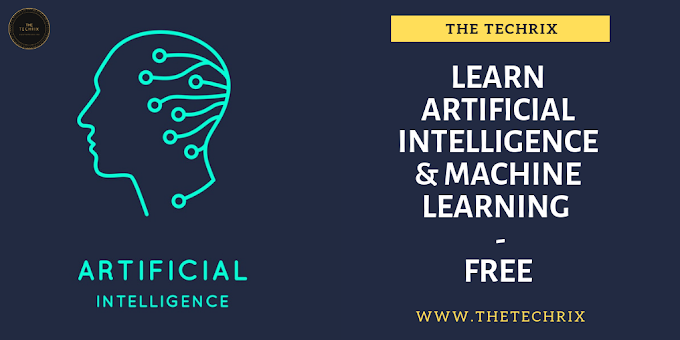 As you are fascinated to learn Artificial Intelligence and Machine Learning then I would highly recommend you to learn from the best FREE resources I am going to mention below. Machine learning is a subset of Artificial Intelligence, which is a root term for any computer program. Artificial Intelligence (AI) and Machine Learning (ML) are two extremely hot trendy topics at this time, and regularly appear to be utilized in surrounding. Since, these are generally new innovations and have a popularity in the present demand, it can get somewhat ambiguous and difficult to understand it. Before you decide which course is perfect for you, then first of all you need to understand every aspect of Machine Learning and Artificial Intelligence, it is best to get a short understanding about Artificial intelligence and Machine Learning. I will try to give you a short description of Artificial Intelligence and Machine Learning in simple and easy words. Let’s begin with Machine Learning (ML) — It is an application of AI, It includes giving a structure to learn naturally and enhance without being explicitly programmed and modified by any other programmer or developer. Sounds fashionable right? This category focuses around the improvement of computer programs that can get to information, learn it, and use it for themselves, just like a human child. Now, let’s talk about the Artificial Intelligence — You should have officially some over this term and maybe know about it, I am sure that you like watching science fiction motion pictures, in which you have seen bloodthirsty robots out for control human lives. However, that is not what AI is, truth be told, and I am sure you’re connecting with artificial intelligence on daily basis. Okay, let it be more simple — At the point when YouTube suggests you other creators videos, which you clearly like. That is Artificial Intelligence (AI)doing its activity there. Another example would be Amazon Echo, Alexa when you interact with Alexa or Google Assistant, you’re essentially co-operating with Artificial Intelligence (AI). Now you are getting it right? AI is like machine learning however in machine learning the program gains from the huge information base or knowledge database at its exposal to learn more and enhance new capabilities for activity, though artificial intelligence interacts with the atmosphere to learn and give beneficial outcomes. Artificial Intelligence is used to taking care of real-world issues including investigations, entertainments, machine learning, explanation, understanding natural language, computer systems vision, heuristic structure and so on. Learn Python and SQL: — The basic thing that you need to do is take a course in a programming language. There is a huge symmetry of languages that you can start with, Python is the thing that many like to begin with, on the areas that its libraries are extensively improved adapted to Machine Learning. This course gives the basics of Artificial Intelligence (AI), and apply them. Object intelligent agents to resolve real world problems including, search, games, machine learning, logic, and constraint satisfaction problems. Linear algebra, Probability theory, Calculus, Multivariate Calculus, Graph theory, Optimization methods. Practice Few Applications: — When you have an absolute attraction to your favored programming language and enough practice with the basics, you should start to take in additional about Machine Learning. In Python, start learning Scikit-learn, NLTK, SciPy, PyBrain, and Numpy libraries which will be important while building Machine Learning calculations. I would personally recommend Microsoft Professional Program in Artificial Intelligence by Microsoft because this course exercise is completely free and simple for a beginner. Since it is advisable to take the support of this course and understand the basics of machine learning as it will give you a smart thought about the entire machine learning idea. Things are instructed in very well order, it is all active and not hypothetical. I like this course since it covers just what is required and no more and it is all around clarified. Now, Please share this article on WhatsApp and Facebook, I’m sure they’ll love it! And, please use comment section and let us know if you need any Career Advice. Feel free to ask your questions.